Orchard management practices have the potential to influence carbohydrate supply to storage organs, including buds. 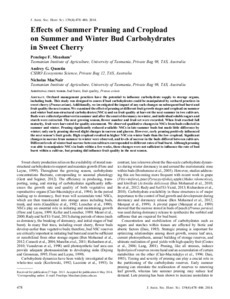 This study was designed to assess if bud carbohydrates could be manipulated by orchard practices in sweet cherry (Prunus avium). Additionally, we investigated the impact of any such changes on subsequent bud burst and fruit quality the next season. We examined the effect of pruning at different fruit growth stages and cropload on summer and winter bud non-structural carbohydrates (NSCs) and on fruit quality at harvest the next summer in two cultivars. Buds were collected postharvest in summer and after the onset of dormancy in winter, and individual soluble sugars and starch were extracted. The next growing season, flower number and fruit set were recorded. When fruit reached full maturity, fruit were harvested for quality assessment. We observed qualitative changes in NSCs from buds collected in summer and winter. Pruning significantly reduced available NSCs in late summer buds but made little difference by winter; only early pruning showed slight changes in sucrose and glucose. However, early pruning positively influenced the next season’s fruit grade. High cropload resulted in higher NSCs in winter buds than the low cropload. Significant changes in sucrose from summer to winter were observed, and levels of sucrose in the buds differed between cultivars. Different levels of winter bud sucrose between cultivars corresponded to different rates of bud burst. Although pruning was able to manipulate NSCs in buds within a few weeks, these changes were not sufficient to influence the rate of bud burst within a cultivar, but pruning did influence fruit quality in the next season.